I love making homemade coconut milk ice cream. I've tried a lot of different recipes and techniques, and sometimes I just wing it--but it does take a lot of trial and error and sometimes it doesn't work out! 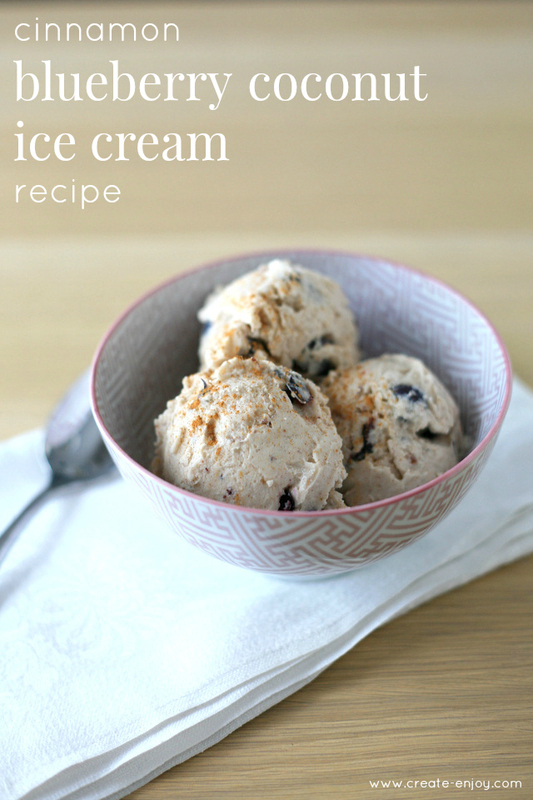 I've gotten creative with recipes and solutions for tasty dairy-free ice creams! It's been hot this past week, and getting me thinking about summer. I love picking blueberries at u-pick farms, and we still have 2 large freezer containers of berries from last summer. Time to use them up, right?! I used frozen blueberries for this recipe, but you could try it with fresh ones after blueberry picking in July! A lot of the blueberry ice cream recipes I looked at (dairy free/Paleo like this one or conventional) used blended blueberry mixture in the ice cream. That sounds tasty, but I know from making fruity ice creams before that the more fruit you add, the icier it gets--less creamy from the fat in the cream, more like a sorbet. I wanted creamy ice cream, so I left the blueberries whole. I've often used egg yolks in coconut milk ice creams, but there is some timing involved in making the custard, or just calculating the ratios of egg yolks to milk... I'm not a pro at this yet so it's sometimes a little too complicated. So this recipe uses gelatin for thickener! Another great use for Vital Proteins or other high quality grassfed beef gelatin. It's high in protein and gives a delicious smooth texture. (Read my post here on what I use their collagen peptides for!) If you don't already have some, I highly recommend some Vital Proteins gelatin for desserts and other recipes (here or here), or the peptides for cold drinks. We have a very basic ice cream maker (like this), and I'm getting to test its limitations. (My friend has this one which seems like a good upgrade). Depending on the size of your ice cream maker, you may need to make this in multiple batches. Combine dissolved gelatin, coconut milk, honey, vanilla, and cinnamon in glass bowl. Heat in microwave or warm oven if needed to blend gelatin. (May not be necessary if your coconut milk was warm or room temperature). Blend together with a handheld stick blender, or use a standard blender (harder to clean!). If it is warm, cool in refrigerator or freezer until cool. Add whole blueberries to coconut milk mixture. Assemble ice cream maker and turn on. Pour combined mixture into ice cream maker and churn until done. Serve immediately! Top with cinnamon, coconut flakes, or more blueberries if desired.